OTTB TryDelta, just barely three years old came home today off the track forever. 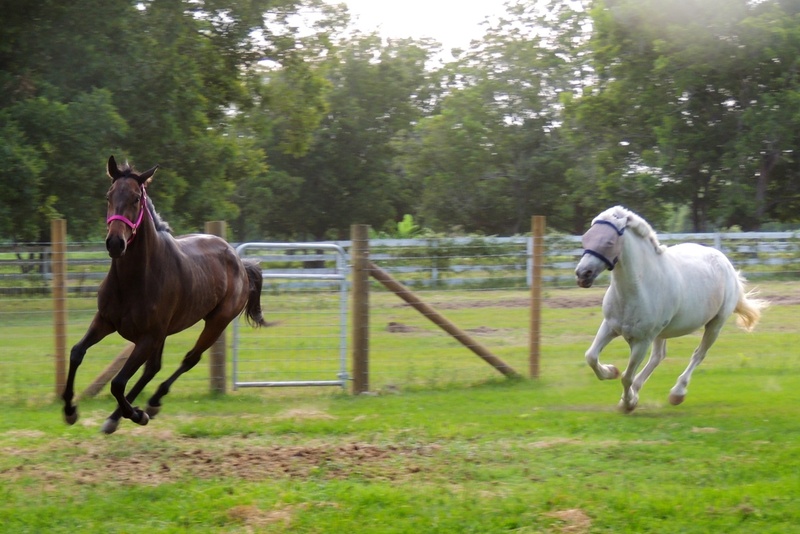 Showing that thoroughbred speed as she easily out runs the white pony. In an absolute contrast to her A. P. Indy cousin, Bruno, TryDelta, by A.P. Delta, out of Native Penny by Saxton, is petite, refined and race track lean. Barely three years old, she has not finished growing or filling out. She might be 900 pounds after a particularly large meal and stands about 16 hands. Bruno is almost double her weight at 1650 pounds and sticks at 17.2 and some hands high. Bruno sports lots of white “chrome” as we call it and this mare does not have a spot of white. Moving pretty cute for the first time in a pasture in months. So how in the world when I have every stall accounted for and finally had given up on the whole let’s breed a mare to Feather’s sire Flagmount’s Freedom, did this new A.P. Indy mare show up here? Well, let’s back up a bit for those of you who maybe don’t manage to catch every word of “Exechorseluver”. Feather, a Flagmount Freedom mare had been sent to my friends in Florida. She was young, apparently had some major trust and training issues and wasn’t near the size her half sibling, Prince had been. She was in fact a disappointment to this solid eventing group. She was offered on Facebook for a very reasonable price. I jumped at the chance to pick her up, hoping some part of the Flagmount jump, determination and personality lived within her. Watching her unload with a group of top-notch horses from Irish Day Farm and the Bruheim’s Nordic Lights Farm was a little like watching you country cousin come off a bus in bustling New York. All the parts were the same but Feather was not looking very special. Dr. Lynn Criner has cared for her since the first days. She has followed my stories about Feather’s rise in jumping, higher and higher, as she keeps accomplishing more. And even a quick look at Flagmount’s Freedom Facebook page, will show you various youngsters he has sired. What do they have in common? Boy, can they jump. But Lynn had never seen Feather actually compete. The slightly neurotic and often frightened mare, becomes super mare when she heads in the jumper ring. She jumps anything and everything and only stops in Lauren makes a mistake. I guess it impressed Lynn. Saturday at the show we talked a lot about a mare to breed to Flag as he is getting older and time (for this year anyway) is getting short. And, yes, I do remember clearly in the post on Betty Sue that I swore off mare hunting and breeding. But then things changed. We had a friend who volunteered her warmblood mare for breeding services. We were excited about this. Seemed perfect! The next day, they backed out saying they didn’t want to risk the mare in childbirth. I get it-but I had already contacted the Flag people saying we were ready to breed. Unbeknownst to me, Lynn had contacted the trainer of the A.P. Indy mare to see if she was still available. On Father’s day, Lynn suggested to her husband, an avid pilot, that they fly to San Antonio. It couldn’t have been greater! Her husband got to fly and they went off to the track to see the mare. Lynn didn’t mention she was a vet. Why complicate things. Just as I was contacting Lynn to tell her we lost the services of our friend’s mare, she was reaching out to me, to sing the praises of TryDelta, soon to be an OTTB. Dr. Marden, owner of Flag (the sire) told us to find a smaller, refined thoroughbred to offset the Irish bulk that comes with Flag babies. We love Bruno and his A.P. Indy lines and we couldn’t have drawn a more perfect match to what Dr. Marden requested. Sometimes things just happen and you trip along stupidly until you see the solution that has been under your nose for some time. 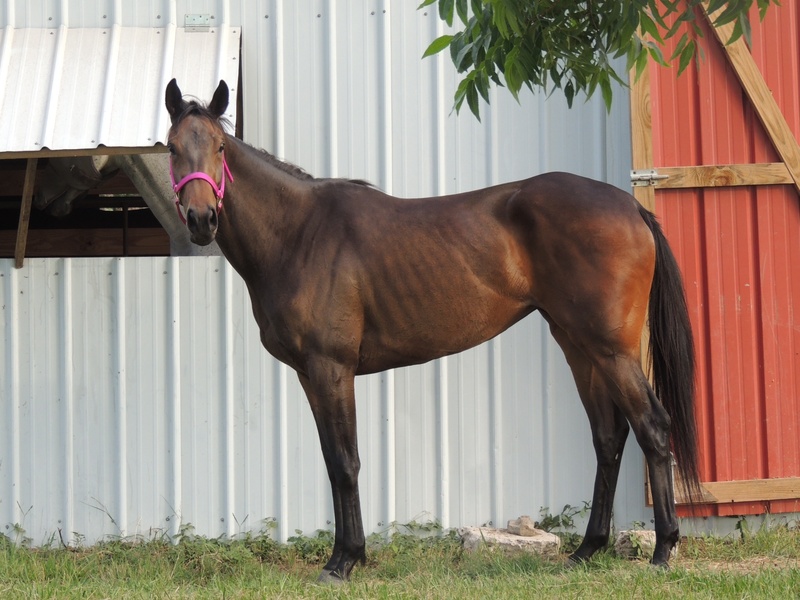 Lynn loved the way the mare moved, she is exceptionally thin and just barely three years old. She will grow some. It felt exceptionally good to take her away from the track and head her home to my meadows of green. Another rescue gone right! Yesterday in the trip from hell, (which I will write about later when time soothes some wounds) we drove the trailer down and picked up the little mare. Essentially for many months now, she has stood in her stall except when out to exercise or race. She seemed to know instinctively that we were there to save her. The trainer warned us she didn’t like people much, but she dropped her head into Lynn’s arms as we arrived. I took her halter and she slowly licked my hand. Sweetest mare ever. I swear they know. She loaded easily and quietly into the trailer. We headed home. After dinner I took her out to graze and learn about the pasture. She could not have been happier about the beautiful green grass-it was gold to her. I started her out this morning in a paddock on her own, afraid she would run a lot and be a little silly. But she quietly inspected things and talked with cousin Bruno over the fence. She and Bruno bonded over the fence and later I moved him in the pasture with her. They were inseparable the rest of the day. Jordyn’s cousin is here for the summer and she just met her for the first time. But as time has passed, they have found many like traits, similar expressions and hair spun the same golden brown. It was much like that with Bruno and TeeDee today. They are absolutely the same color. TeeDee is missing her cousin’s white chrome but is just seems elegant-like she has on a simple black dress. We will try to breed her this season if we can. Hopefully, next year at this time an A.P. Indy/Flagmount Freedom baby will be making their way out into the world. What a horse that will be! As always, thanks for riding along!! 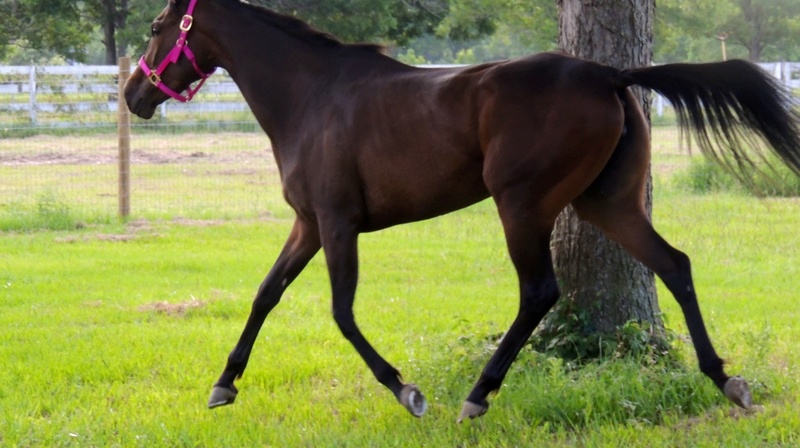 This entry was posted in A Bruno Story, A TeeDee story, Horses and tagged adopting off the track horses, CANTERUSA, making a difference., OTTB rescue by Exechorseluver. Bookmark the permalink.